Hero mission: Find the center of the Black Comet! The Black Comet is the home of the Black Arms aliens and the setting for much of the late game of Shadow the Hedgehog. There are three levels set on the comet: Final Haunt, The Last Way, and a stage actually called Black Comet. 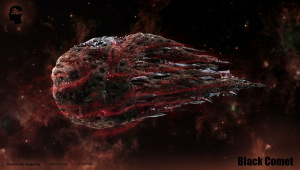 The Black Comet seen from the outside, in game development art. A red/charcoal planetoid in the same solar system as Sonic's world, the Black Comet orbits the sun every 50 years. Prior to the events of Shadow the Hedgehog, the appearance of the Black Comet in the sky was associated with a rather more merry "Fire in the Sky" celebration. However, it is in fact the home of the sinister Black Arms species. Whether the aliens actually evolved on this murky worldlet, or migrated to the comet from elsewhere, is never addressed, though Doom implies in Sky Troops that they have inhabited it for at least two millenia. The interior of the comet is largely hollowed out to accomodate the Black Arms; a nightmarish, otherworldly habitat with giant, writhing tentacles embedded in the walls, and poisonous crimson ooze filling entire caverns. Fifty years ago, as Professor Gerald Robotnik was working on Project Shadow, the Black Comet passed close to Sonic's world and the Space Colony ARK. Black Doom made contact with Gerald and agreed to help in the Professor's research, offering some of his genetic material to create Shadow the Hedgehog (and possibly the Biolizard) - thereby making Shadow part Black Arm and fostering the emnity of the future GUN Commander, who spied on the procedure as a child. Orbiting back into the inner solar system after the events of Sonic Heroes, the Black Arms launched a massive invasion of Sonic's world from the Black Comet, storming the United Federation. Black Doom attempted to use his genetic connection with Shadow, and knowledge of the hedgehog's past, as a means of controlling the Ultimate Lifeform to gather up the seven Chaos Emeralds. In the game's Last Story we learn why he needs the gems: Doom tells Shadow that the Black Comet's acceleration isn't sufficient to make it down to the planet's surface, but a seven-Emerald Chaos Control teleportation will do the trick instead! Warping down through the atmosphere, the Comet roots itself above a ruined city, apparently to facilitate the final, unstoppable phase of the Arm's global conquest. After beating the final boss, Devil Doom, Super Shadow pulls the same Chaos Control trick he did after Finalhazard, warping the Black Comet back up into a stable orbit. It doesn't stay there long, however, as Gerald's final back-up plan against the Black Arms activates: the ARK's Eclipse Cannon fires right at the comet, blasting it into fragments and presumably destroying every last one of the aliens. 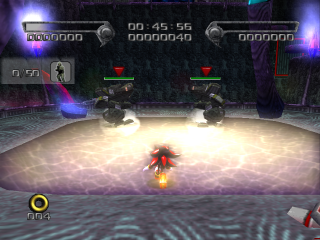 As an eponymous level, Black Comet is one of five possible sixth levels of Shadow the Hedgehog; in the game's branching path structure, it follows from taking a somewhat evil, Robotnik / Black Arms-aligned path through the previous levels. Although the Black Arms have held the initiative for most of the war, the human counterattack on the Black Comet has Doom scrambling to reinforce his defences, calling back Shadow and (in Iron Jungle) a number of his sortieing armies. GUN mechs are battling their way through the comet's caverns, and Knuckles the Echidna is on hand to help them bash through to the worldlet's core. Unsurprisingly, Doom's Eye wants Shadow to do the exact opposite: defeat all the invading GUN troops to safeguard the alien's home. In front of the fourth checkpoint is a large airship and a path that branches off three ways. Go to the left side to find the door. Behind the door lie two tank turrets and a Shadow crate. This page was last edited on 24 January 2018, at 22:25.